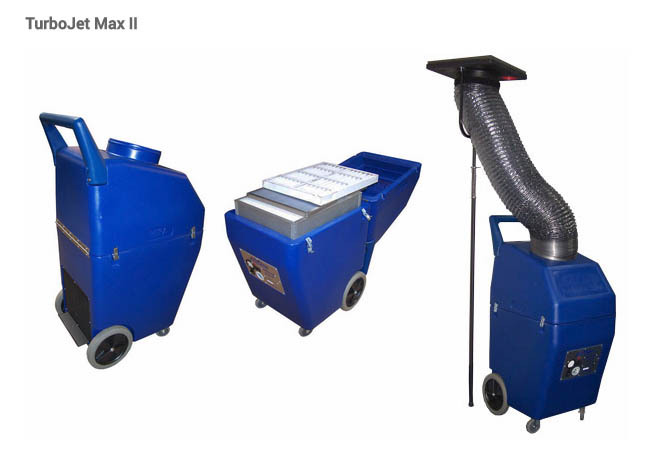 The TurboJet Max II negative air machine is a compact workhorse for residential and light commercial duct cleaning. It’s hard to believe a 22.5” wide cabinet can provide 2700 CFM at 5” static pressure, a full-size 12” inlet, 3-stage HEPA filtration, soft start and will run at 13 or 17 amps and has a lifetime warranty. This is performance that is found in units twice its size and weight. The legendary performance and size of this type of machine has been proven aboard ships and off-shore drilling rigs, as well as mobile homes and 6,000 room hotels, and yet it is perfect for a one-person operation out of a van, trailer or box truck. The TurboJet Max II uses the same ESP speed control found in the TurboJet 4200. The power inverter converts 115-volt single-phase household power to 3-phase 220-volt power. This eliminates the start-up power surge required by a single speed motor. Versatile Ultra Low Volume Fogger The Fogmaster Micro-Jet ULV 7401 fogger allows precise adjustment of particle size, to less than 7 micron VMD for ultra low volume application. This allows use of more concentrated fogging solutions and speeds up treatment time; the Micro-Jet covers 2-4,000 cubic feet per minute when applying ULV insecticides at typical label rates. A 9-turn precision valve controls liquid output and droplet size. Set the valve to a low flow rate to produce near-invisible ULV droplets. For heavier fogs and mists, increase the flow rate. Once the valve setting is established, you can use the vernier calibration to return to the same setting. You can also snap a lock ring to prevent accidental changes. Chemical flow rate is easily calibrated in the field to adjust for differences in liquid density, viscosity or surface tension. 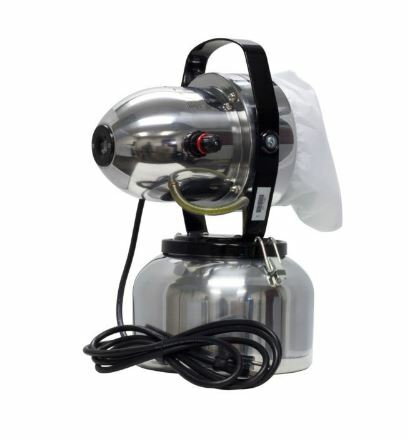 The Micro-Jet handles both water- and oil-based liquids, so this one machine can satisfy all your fogging requirements. The Micro-Jet ULV is widely used in schools, restaurants, zoos, barns, hotels, and similar locations requiring professional application. Light-weight, and supported by our five-year limited warranty, the Fogmaster Micro-Jet ULV is an outstanding choice.